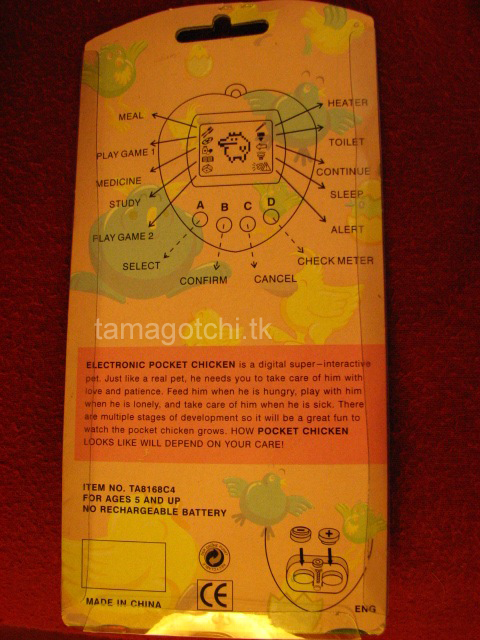 The Chicken is a pet I bought on eBay over a year ago. 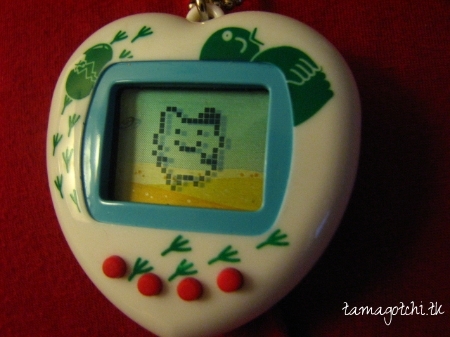 It is basically just like any other Hitorriko pet with the exact same functions. 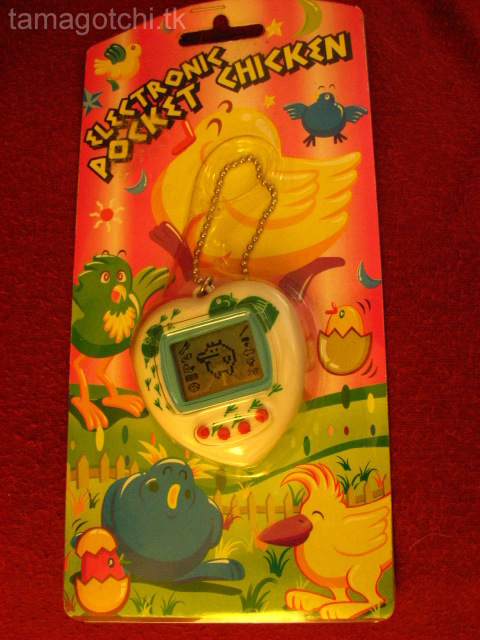 It has icons that go up and down the side like the Dinkie pets. 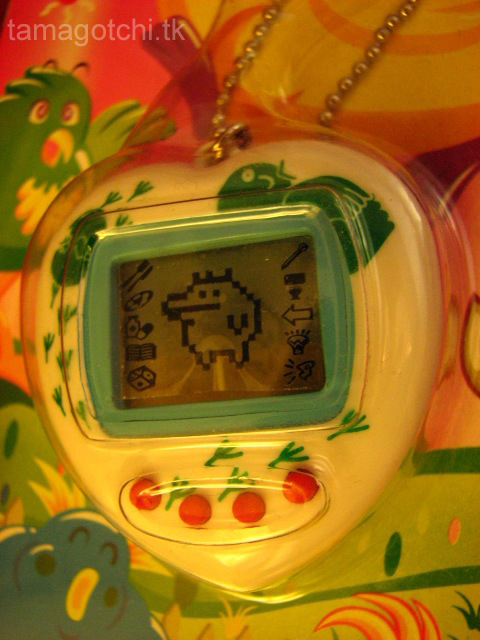 The pet has big pixels and the characters stay pretty stationary except for some minor movements. It eats a burger, some kind of dessert and a drink. 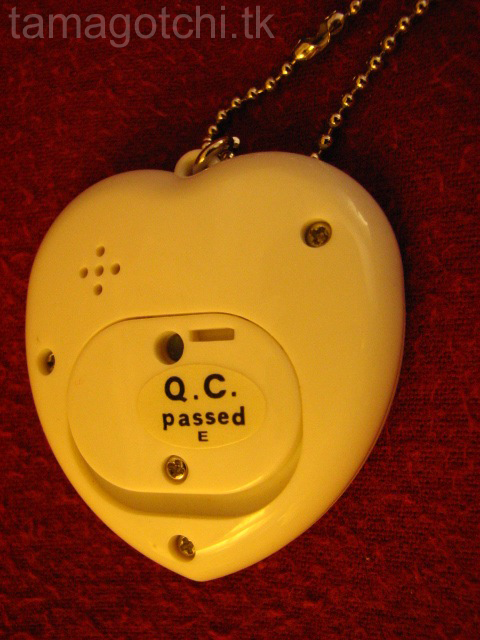 It plays a "back-and-forth" guessing game. The third icon is for medicine. Fourth icon is for studying. Five icon is for a dice guessing game. Sixth icon on the right side is temperature. I have never had to change the temperature so I'm not sure if it does anythig regarding that. Seventh icon is for the toilet. The eight icon only shows up when the pet is hungry (its an arrow). I'm not sure why this icon exists since it already has an attention icon for when it needs something. The ninth icon is for the light and the last icon is for when it beeps for attention. This pet poops A LOT. So did the Hitorriko dinosaur I have (Pocket Pal). The transformations on this one started out as a chicken. 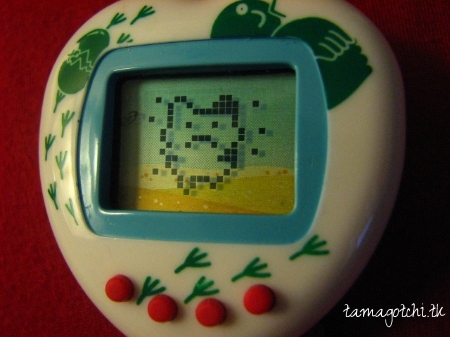 It transformed twice and still looked like what could pass for a chicken, but then out of nowhere it transformed again and turned into this random Mametchi looking character O_o (pictures below). While this is cute and not a huge disappointment, I just wonder why they designed it to be this way. I will try raising it one more time to see if I get anything else that resembles a chicken. Pretty silly. After playing with the Hitorrikos a bit more I would give them a 7 out of 10. While they are not particularly creative, they are easy to care for, at least somewhat cute and the transformations are interesting, albeit random. Since they are relatively cheap I would recommend this pet. My major complaint is that the shell design is so cheap with cheap plastic and a screen that is not covered with an extra layer of plastic. The screen is also really embedded so there is always a shadow on one side when looking at it. 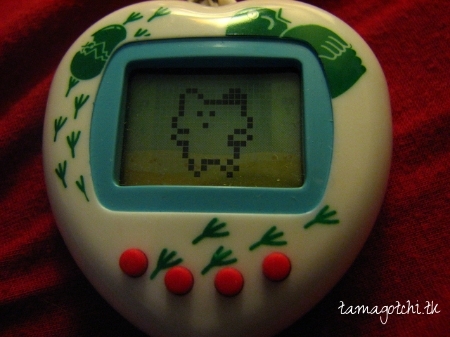 Not a huge deal, but not exactly aesthetically pleasing the way most Tamagotchis are designed. I think I may try to collect the fish and puppy at some point, or any other Hitorrikos that may exist. I bought this for about $20 on eBay and they still seem to go for about that same price. I do not have a growth chart.